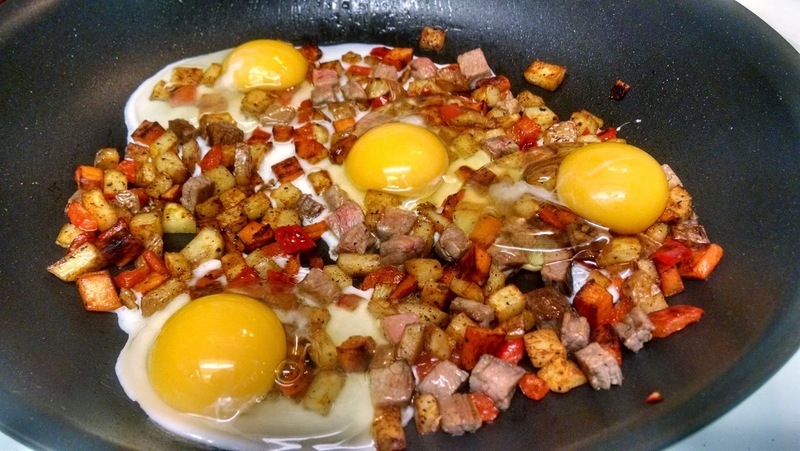 It’s the weekend and you are ready for breakfast, but you don’t have really much around the house but a few eggs, potatoes, an onion, some leftover steak or other meat, mushrooms, and some bell peppers. Guess what? 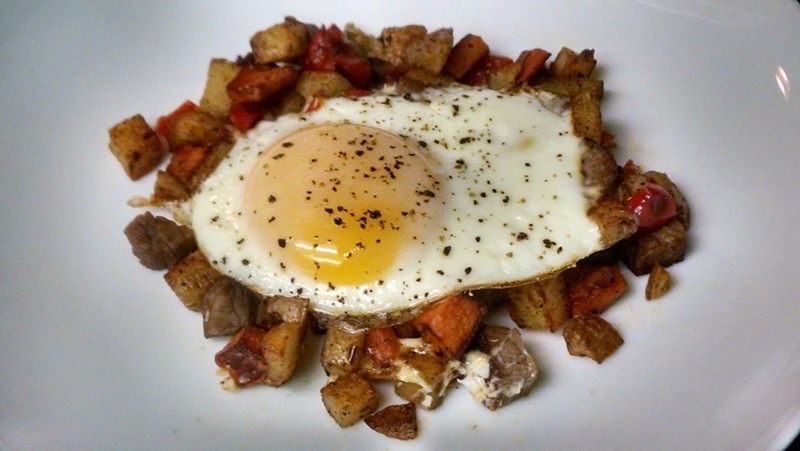 You have a super easy, delicious breakfast at your fingertips. Food doesn’t need to be fussy to be amazing. So what the heck do you make with all those ingredients? 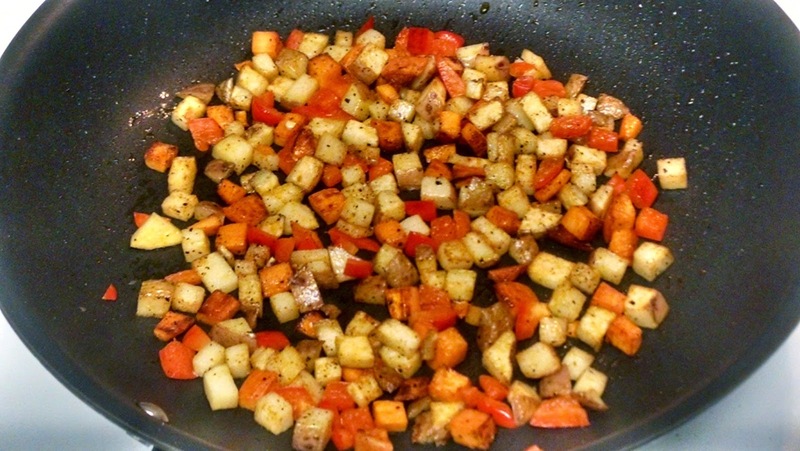 We are making breakfast hash. Like all the recipes I post, I tell you that you can customize this according to your likes or needs. Recipes should be interchangeable otherwise you may lose out on the creative energy that being in the kitchen provides. Ready to get this started? OK, let’s go! Cube up some potatoes, I recommend either russet potatoes or red potatoes as a base. Looking for another twist? Do what I’ve done in this photo and use some garnet sweet potatoes mixed with the regular potatoes. Not only is it a nice color contrast, and we eat with our eyes first, but these potatoes provide a little sweetness and are a great counterpoint to the other flavors. With about three tablespoons of oil and on medium high heat throw the potatoes into a cast iron skillet or a heavy-bottomed nonstick pan. Like with steak, once you put the potatoes down, don’t touch! 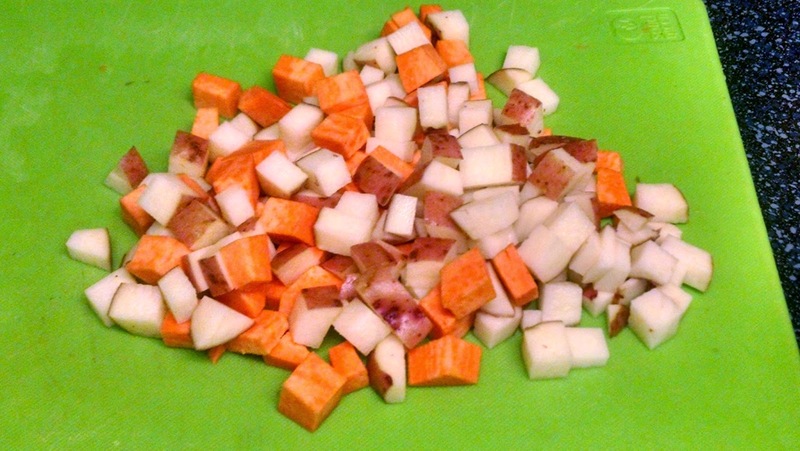 Leave the potatoes alone for at least 3-4 minutes until you start to see color like in this photo. Season with salt and pepper and you can add other seasonings if you like. If you are doing a more savory profile you can add some garlic powder or paprika. 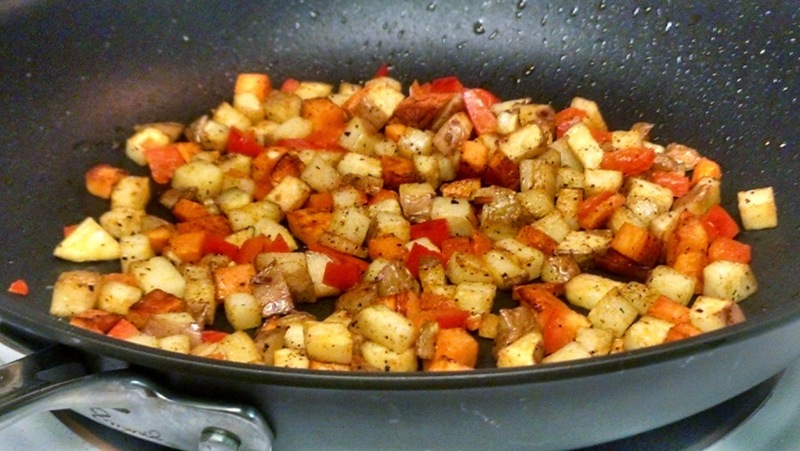 I did use paprika here as the earthy, smokey notes are balanced with the sweetness of the sweet potatoes. Oh, after you start to get some color on the potatoes begin adding things like onions, or bell peppers. If you use cast iron, keep an eye on the heat so your potatoes don’t get too dark!! That doesn’t make for a good start to the weekend, I assure you. When you have all your base ingredients cooked most of the way through, crack some eggs into your pan. Set your oven to about 400 degrees on broil, or you can finish the eggs in the oven on “bake.” Keep in mind, we want to cook the eggs through, but leave the yolks runny. The eggs will have some carry over heat so keep an eye out for overcooking the yolks. Good tip: You can press very gently on the yolk once its begun to cook, the more give it has the softer/runnier it will be. 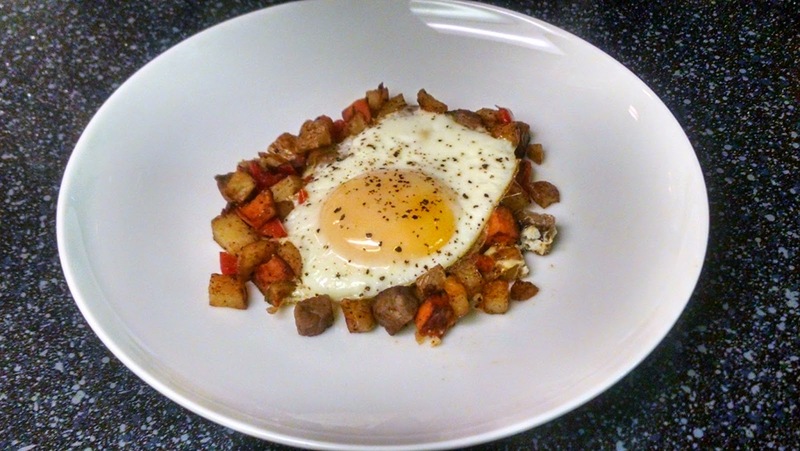 Here is the finished hash……what? You want a finished plate? OK, if you insist! Hash’s photo shoot close up. 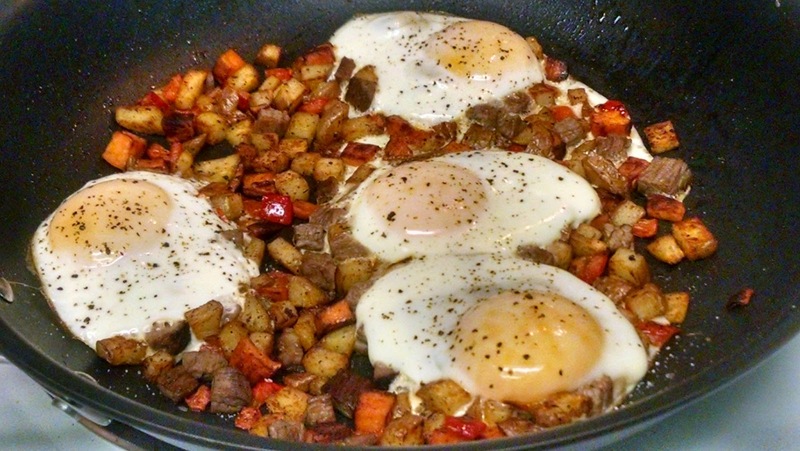 This is a delicious hearty breakfast any time, and also can be doubled-down for dinner as well. Enjoy!